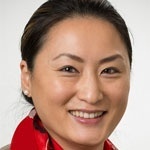 Michelle Wu is VP digital technology & chief information officer at GE’s Power Services - Middle East & Africa, based in Dubai, UAE. Her priority is to transform GE Power’s internal digital culture, deliver productivity through the digital thread, and enable enterprise intelligence, among other responsibilities. Wu leads the GE Women’s Network’s Women in Technology initiatives in the Middle East, with a mission to increase the number of women in STEM fields in the region. She can be reached via michelle[dot]wu2[at]ge[dot]com or via Linkedin.